Add any expression pedal controller to the EXP input on the back and you have control over the Rate of the “Les Rotary” and “Kool Vibe” settings. In the “Harmonic Wah” setting, it controls the frequencies. Want more sounds? Well OK, turn the unit over and take the bottom off. There is a tiny DIP Switch that allows you to change the order of the Fuzz and Modulation effects! Yes, you can get some crazy noise by putting fuzz after modulation effects, but it works! And works well at giving you insane tones that are thick and full. Let your ears gaze at the strangeness. Alien amplitudes of gain and fuzz. Endlessly creative. The Monterey does not come with an expression pedal, as many players already have one they can use. We do offer the M-Audio expression pedal. It works well and is very reasonable. The Monterey is not battery powered. You will need a standard 9V 100mA supply, negative tip. 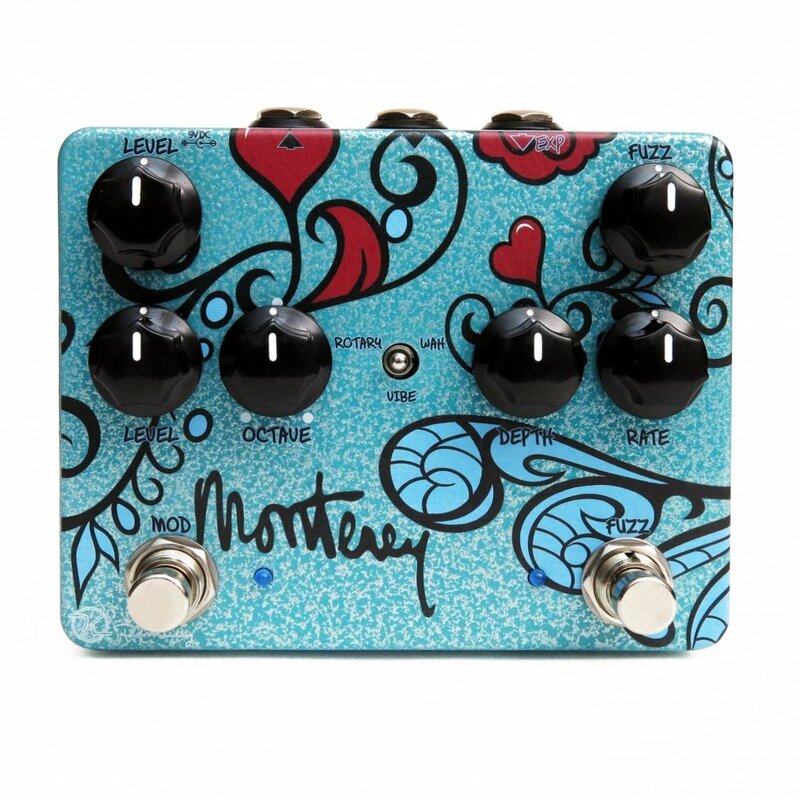 The Monterey Rotary Fuzz Vibe comes in 12 different graphic designs. Just like music which can be surprisingly rewarding, you’ll be surprised with a design. We will not be able to select a specific pattern that you may want. It is wonderfully random. They are hand made with the intention of becoming your new favorite instrument.